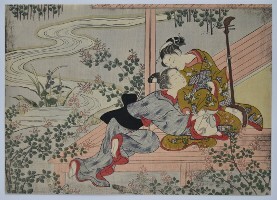 A wonderful chuban shunga print showing a young suitor leaning across an engawa and interrupting a beauty playing a shamisen by partially lifting her robe. They are surrounded by flowering bushes and a meandering stream. A rare design I cannot, at the moment, locate being illustrated. Published c. late 1760s. Very fine impression on thick hosho. Extremely fine colour. Slight oxidation, otherwise fine condition. A fine chuban from a series parodying the Seven Gods of Good Fortune, this being Daikoku, the god of wealth, seen here attempting to stand on one of his straw bales of rice. 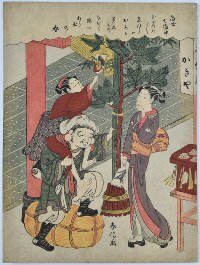 The famous waitress Kasamori O-sen (1751-1827) stands holding a battledore on New Year’s Day while her companion balances on Daikoku’s shoulders attempting to retrieve the shuttlecock caught in the kado-matsu decorations using her own battledore. The lantern on the right reads Kagi-ya, which was a tea-house located by the Kasamori Inari Shrine in Yanaka, north of Edo, which was owned by O-sen’s father and where she was the waitress. Considered to be one of “The Three Beauties” of her time. (Given the date of the print, she must have been around 18 when shown here.) The Torii gate is seen on the left. The poem above speaks of a New Year’s fresh gem [O-Sen] and how the trees and grasses bend to her. Published c. 1769. 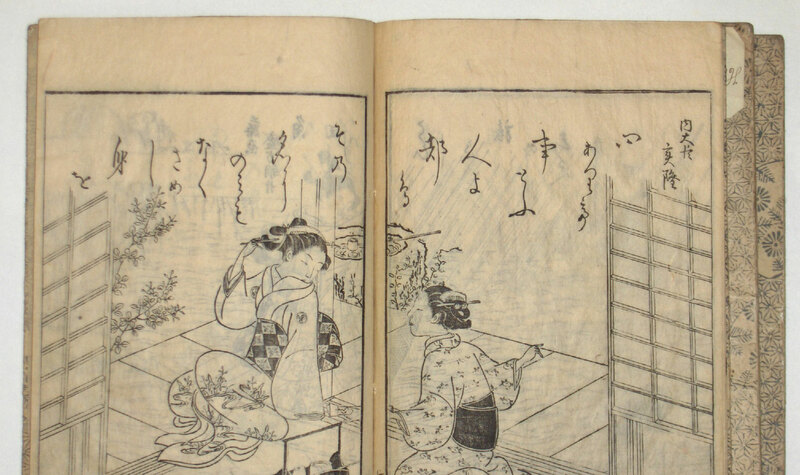 Fine impression: As with many Harunobu, the lines are in relief because of the thick hosho. Exceptional colour: Even the vegetable blue used for the paving stones leading to the temple have not turned except at the extreme left and right. 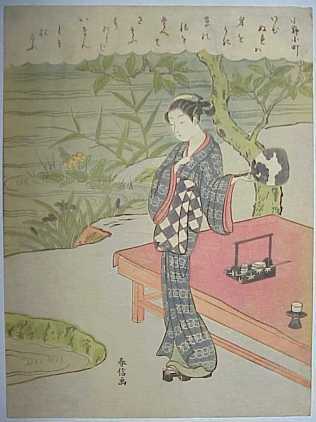 This was a colour used frequently by Harunobu to depict water but is almost always faded to a puce colour. Minimal soil, otherwise a fine example from this period. Signed Harunobu ga.
3 volume complete : Ehon yachiyogusa, “The Plant of Eight Thousand Ages”. Sumi images illustrating old poems with the Sumida River as a central theme. 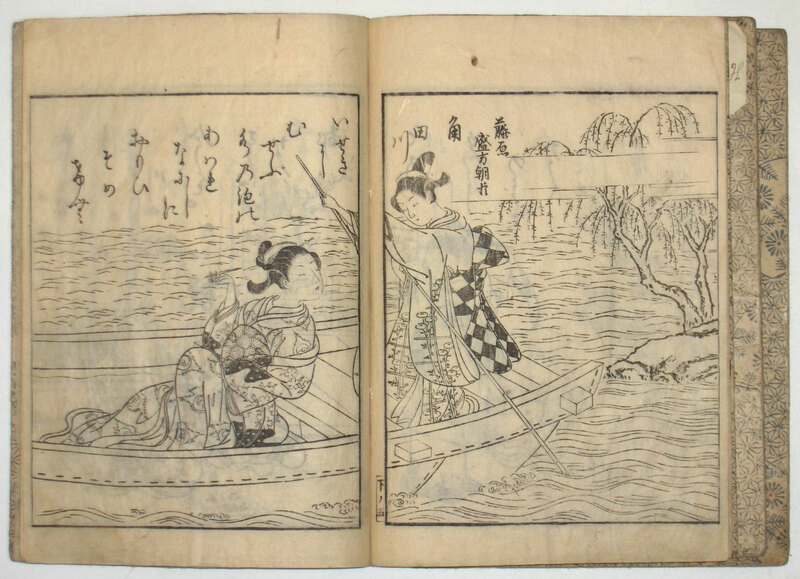 Published Meiwa 5, 1768 by Yamazaki Kinbei. Original covers but later title slips. One page with sumi marks, otherwise good impressions and condition. 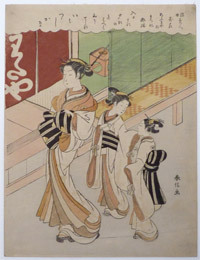 A chuban showing the courtesan Matsukaze of the Ogi-ya House from a set of prints: Ukiyo kika, “Strange Flowers of the Floating World.” Shows the courtesan parading outside a Yoshiwara house with her two kamuro. 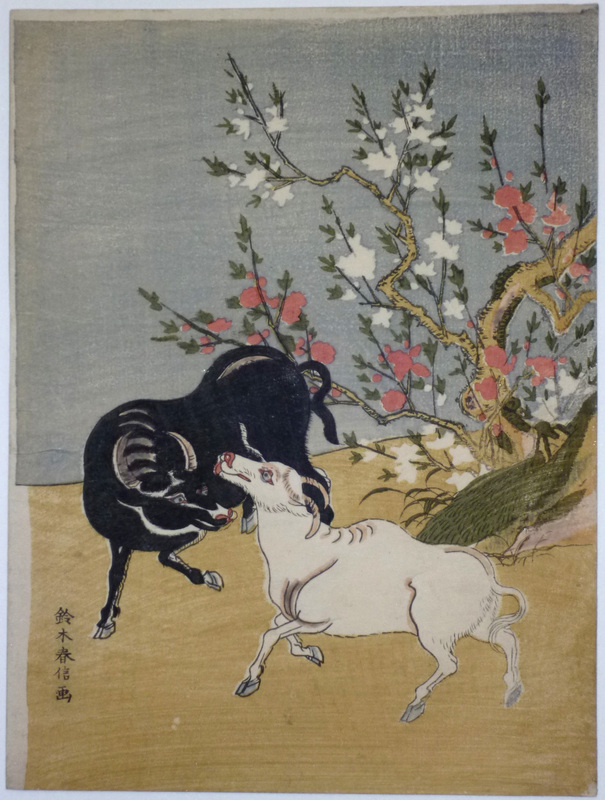 One of the most influential ukiyo-e artists taking full advantage of polychrome printing in 1765 and publishing a large number of exquisite prints, often with innovative pigments and on thick hosho. Published c late 1760s. Another impression in Yoshida, Harunobu zenshu, p. 128. Fine impression. Slight fading otherwise very good condition. Signed Harunobu ga.
A chuban print of a young girl beside a stream. A poem above, by Ono no Komachi, compares her thoughts to a floating reed. One of a series based on “The Thirty-six Poets”. Another impression illustrated in the Philadelphia Musuem of Art catalogue Suzuki Harunobu, 1970, p.141, no.79. Published c.1767/8. Superb impression with the girl’s outline and garment folds in heavy relief. Fine colour with only the water slightly down. 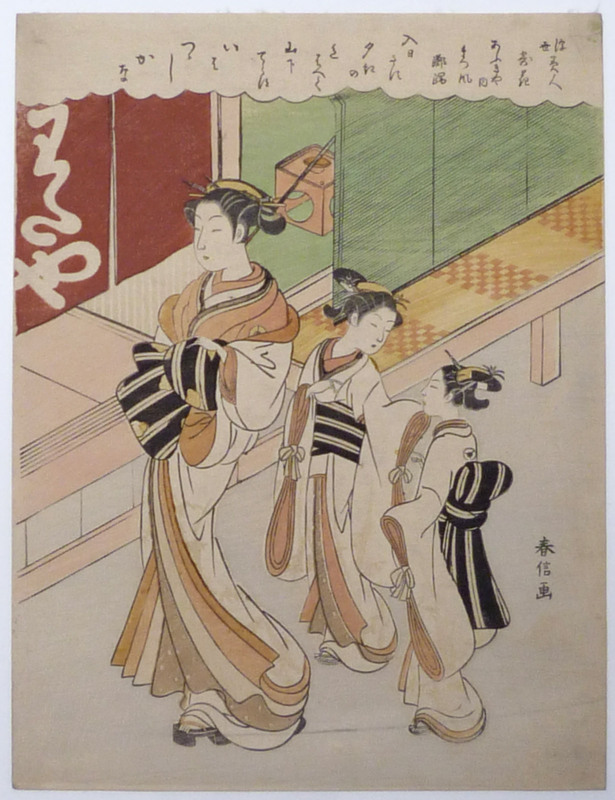 Signed Harunobu ga.
A beautiful composition of a courtesan emerging from a mosquito net. Published c 1760’s. Ex collection Hayashi. Rare: not in Pins or Yoshida. Very good impression and colour. Very slight soil but in very good condition for a pillar print of this period. Signed Harunobu ga..